I know, just with the title and you’re drooling already. It’s okay, it’s not embarrassing, it happens when it sounds that good. I mean, who can resist the perfect flaky crust? 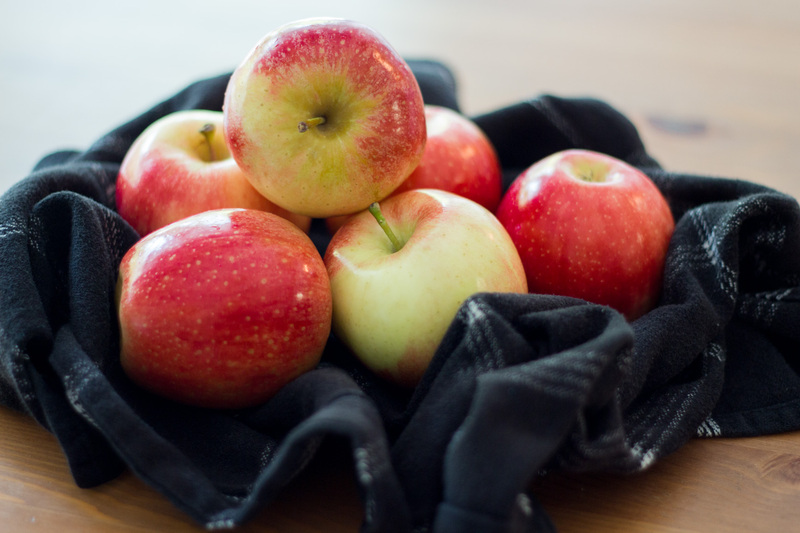 The juicy fall apples cooked in a salted caramel butter? NO ONE obviously! Of course, Fall is around the corner and bloggers are sharing their best pumpkin Latte or an apple recipe. Groceries stores are no different and are pushing to buy pumpkins, squashes or apples. In an effort to cooperate with the rest of North America, I’ll give you an A-MA-ZING recipe. You asked for it. Of course, being French ”cocorico”, I’ll give you this French Tarte Tatin that will blow your mind! I have to confess… I did it a few times but the first one I did, we ate it in one seating. No problem? Well… ONE tart, 2 adults and 2 young children under 4. I suspect it was a complete success. Although, it’s a great news and it means it really is that good… It should come as no shock that I have been feeling a little tight in my pants! C’mon Mélanie, get those healthy soups going!… I will… eventually! 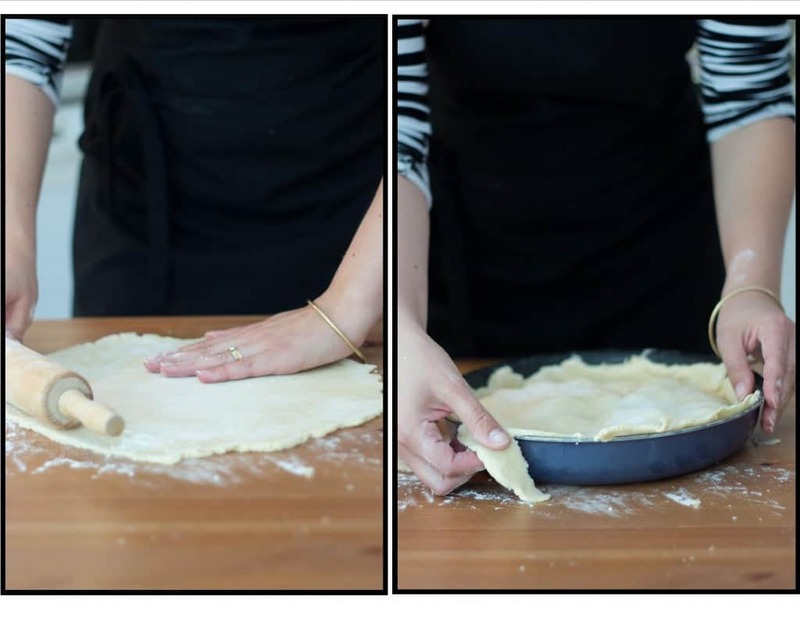 The recipe is really easy to put together and if you need a little reminder about the steps of making the crust, you can find it here. This is the base of so many recipes for salted tartes, quiches or pies. I know the crust recipe by heart and I don’t think I have ever bought a store made since I discover and mastered this one. There is no point in spending the money and nothing beats a crust made from scratch. No time? It takes 5 minutes. Really. If you are a little obsessed with salted-caramel-everything, this is for you! If you love a nice flaky and buttery crust, this is for you! If you like apples, this is for you! And if you need any other reasons to stop resisting, please contact me! You need to indulge and this is yours. ALL of it if you wish! - 6 apples gala, peeled and cut in quaters. - In a pot, melt the butter with the sugar. Bring it to a simmer on the stove. - Remove the butter/sugar from the stove and pour it in a 12" round oven dish. 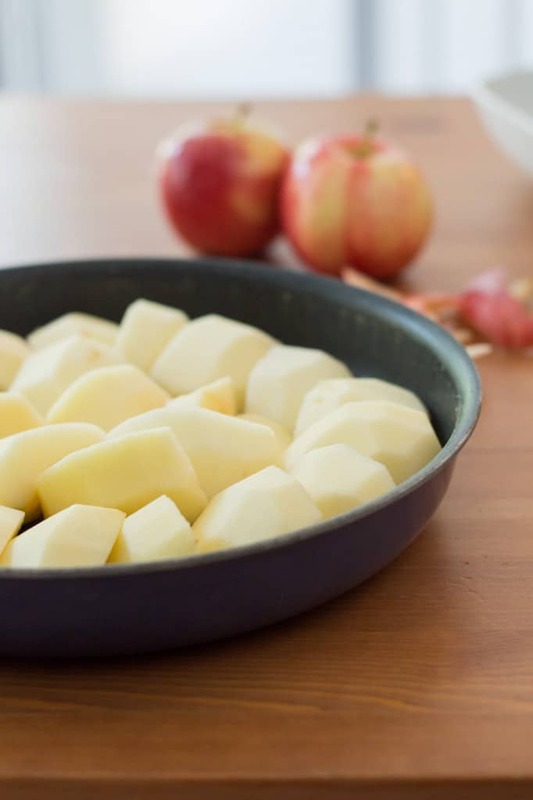 - Place the apples on the butter tightly. - Place it in the oven for 15 minutes. - Meanwhile, in a bowl, put the flour and the butter, mix with your hands until it becomes crumbly. - Add the milk and gather all the ingredients until a ball is formed. - With a rolling pan, roll the dough to make the crust. - When the 15 minutes are over, take the dish with the apples out, place the dough on it and lock the border with the dough. - Bake it another 25-30 minutes or until the dough it golden. 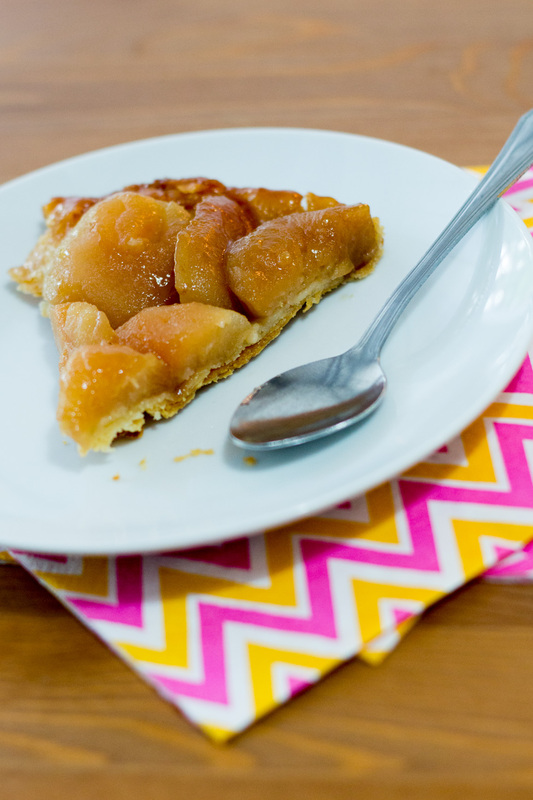 Flip your Tarte Tatin in a serving plate at the last minute. Doing it too early could lead to get a soggy crust. You really really like apples and want more? 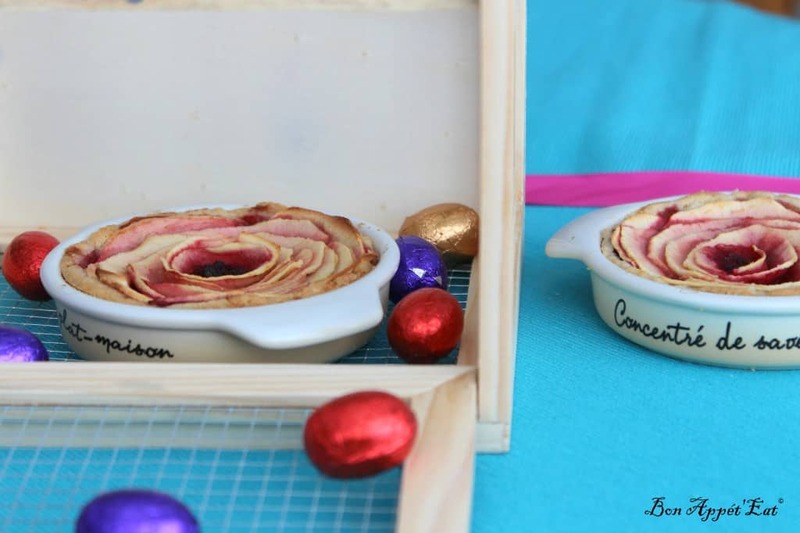 Try this rose apple tart…. You were so right – I was drooling the second I read that title! Sounds delicious! It’s wonderful how simple this is, Melanie! I’d say a regular tarte tatin is pretty difficult to beat, but adding salted caramel would send it shooting up into food heaven. Definitely pinning this one for later! Thank you for stopping by as usual and pinning! I am a big sucker for everything salted caramel and this one what a huge hit in my house! You’ll love it! a damn delicious and healthy sweet bites!!! I have not made tarte tatin before but now I might try. Looks delicious.